Today am going to review an interesting product. Have you ever seen ginger in any body lotion? I have only had ginger chai 😀 . Ginger in a body lotion sounds exotic, doesn’t it? Which is what tempted me to buy this body lotion. This is from a brand called Fruttini. I spotted it on Purplle and they are available at a great discount of 50% or more. If you love fruity fragrances in your bath and body products, you should definitely check them out. They also have a lot of other variants like Cherry Vanilla, Cranberry Choc, Coco Banana, Milky Orange, Raspberry Cream, Peach Pear, Strawberry Starfruit, Lime Mint and Pineapple Prosecco. Sounds delicious, right? 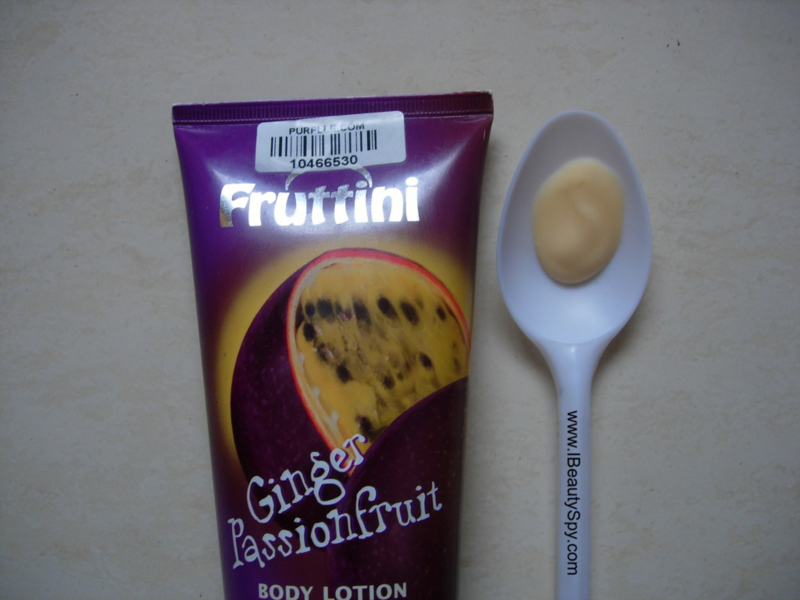 😀 So let’s see how Fruttini Ginger Passionfruit Body Lotion fares. The tropical fragrance of passion fruit makes you long for skin which feels fantastic. Moisturising care elements and real shea butter caress and care for the skin. Aqua (Water), Cocoglycerides, Cetearyl Alcohol, Dicaprylyl Ether, Propylene Glycol, Pentaerythrityl Distearate, Phenoxyethanol, Tocopheryl Acetate, Sodium Stearoyl Glutamate, Dimethicone, Butyrospermum Parkii (Shea) Butter, Parfum (Fragrance), Fructose, Panthenol, Xanthan Gum, Niacinamide, Sodium Polyacrylate, Methylparaben, Citric Acid, Limonene, Ethylparaben, Butylparaben, Isobutylparaben, Propylparaben, Passiflora Incarnata (Passionflower) Fruit Extract, Citronellol, Ci 15985 (Sunset Yellow), Citral, Ci 47005 (Acid Yellow 3). 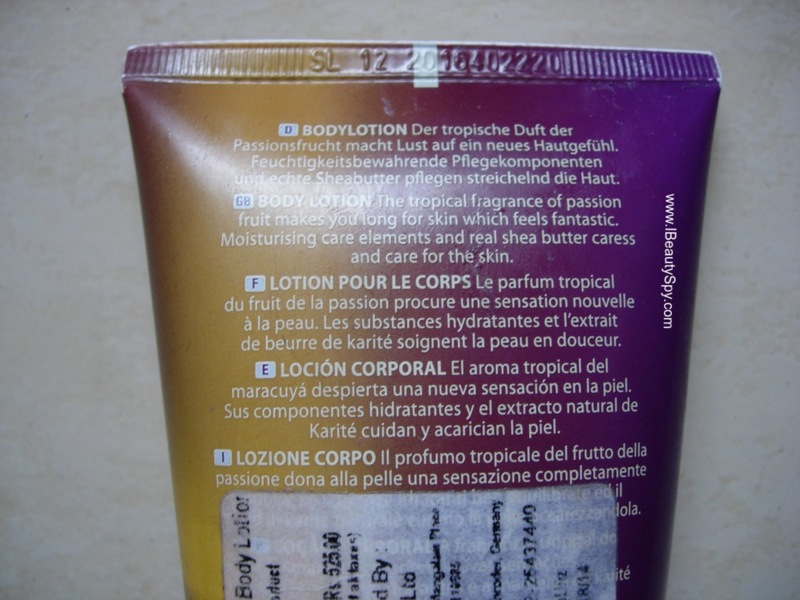 The packaging of Fruttini Ginger Passionfruit Body Lotion reminds me of TBS body sorbets. It comes in a sturdy squeezable tube with colorful packaging like TBS. Fruttini Ginger Passionfruit Body Lotion has a pale white color with a light brownish tinge to indicate presence of ginger maybe. It has a medium consistency, not very thick like a body butter or not very liquid like a body lotion. The fragrance as mentioned is very tropical. I haven’t smelled passion fruit, so I can’t say whether the fragrance is similar. There is a hint of spicy ginger scent also which makes it very unique from other body lotions we have used. The tube is huge and will last for 1.5 months if used once a day. So I find it affordable as well, especially when you get it in a 50% discount. 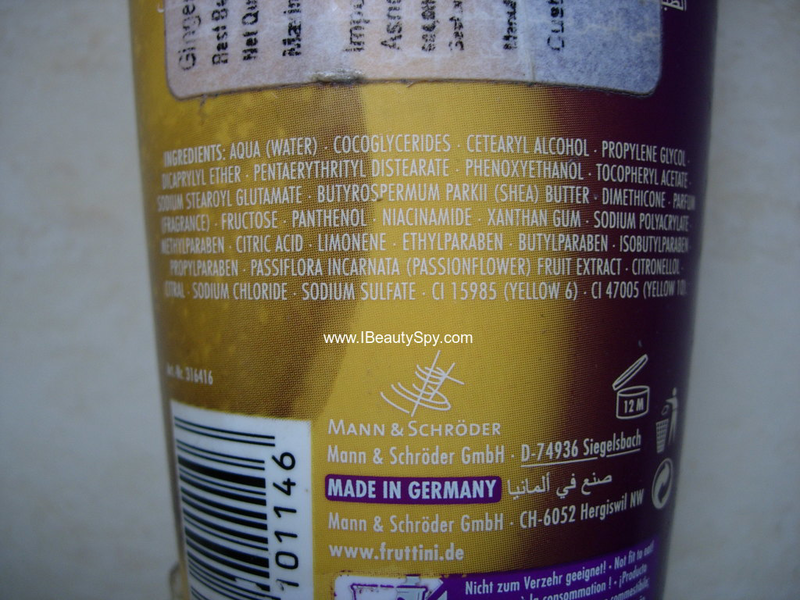 However, it contains a lot of chemicals including parabens. * Unique fragrance of spicy ginger with passionfruit. * Contains shea butter which moisturizes the skin deeply. * Contains lot of chemicals and parabens. * Not worth its actual price. Yes, if you love trying out new fragrances and have dry skin. No. I would like to try their other variants. Its pricey unless you get on a discount. Availability: You can buy online from here or here. Also checkout Purplle for more Fruttini products at great discounts. 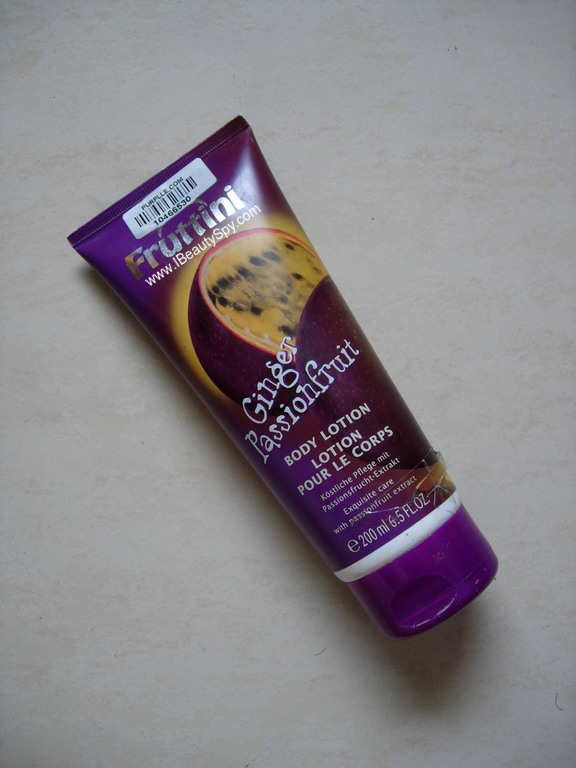 Overall, Fruttini Ginger Passionfruit Body Lotion is a decent enough lotion with a unique fragrance. If you like to try new fragrances, you can go for it. I would also recommend the Fruttini Cherry Vanilla Body Butter which I loved more than this one. However, I wouldn’t recommend going for this brand unless its on a discount since I don’t feel its worthy for the actual price. I like passionfruit scent, this looks so creamy! Seems a little expensive for what you get.